Simply PizzaServed with a Tuscan Salad and a robust Chianti, this delicious pizza is the colorful centerpiece of a quick and easy meal. 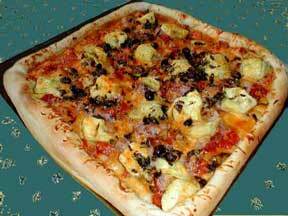 All you need is: a pound of pizza dough from your super market, 1/4 pound of thinly sliced ham, 6-8 artichoke hearts (canned),3-4 plum tomatoes, a handful of black olives, 8 oz. mixture of grated cheddar and mozzarella, 1/2 cup fresh oregano or basil (or 2 tbs dried oregano or basil), and one sliced onion.